The basic law of computer evolution, known as Moore’s Law, teaches that within every two years, the number of transistors on a computer chip will double. What this means is that every couple of years, computer speeds will double, effectively making the previous technology obsolete. Recently, analysts have refined this period to about 18 months or less, as the rate of increase itself seems to be increasing. This explosion in computing power is due to ongoing improvements in the field of miniaturization. As the component pieces get smaller and smaller, engineers are able to cram more and more of them onto chips of the same size. However, it does make one wonder just how far it will all go. Certainly there is a limit to how small things can get before they cease working. According to the International Technology Roadmap for Semiconductors (ITRS), a standard which has been established by the industry’s top experts, that limit will be reached in 2015. By then, engineers will have reached the threshold of 22 nanometers, the limit of thickness before the copper wiring that currently connect the billions of transistors in a modern CPU or GPU will be made unworkable due to resistance and other mechanical issues. However, recent revelations about the material known as graphene show that it is not hampered by the same mechanical restrictions. As such, it could theoretically be scaled down to the point where it is just a few nanometers, allowing for the creation of computer chips that are orders of magnitude more dense and powerful, while consuming less energy. 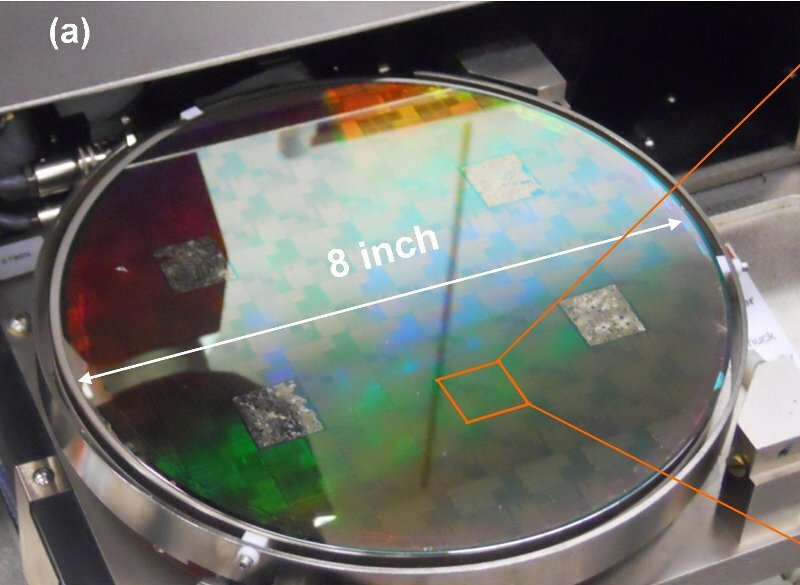 Back in 2011, IBM built what it called the first graphene integrated circuit, but in truth, only some of the transistors and inductors were made of graphene while other standard components (like copper wiring) was still employed. 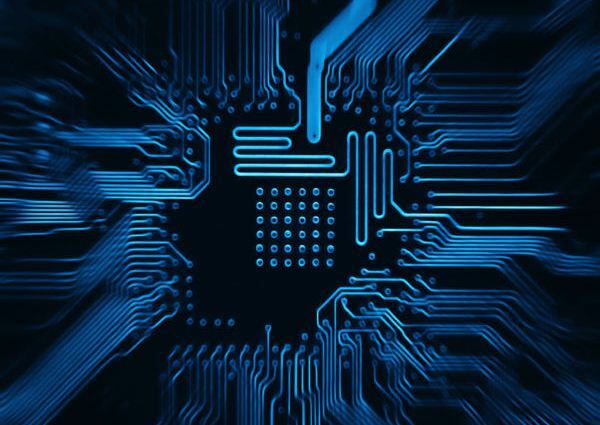 But now, a team at the University of California Santa Barbara (UCSB) have proposed the first all-graphene chip, where the transistors and interconnects are monolithically patterned on a single sheet of graphene. [D]evices and interconnects can be built using the ‘same starting material’ — graphene… all-graphene circuits can surpass the static performances of the 22nm complementary metal-oxide-semiconductor devices. 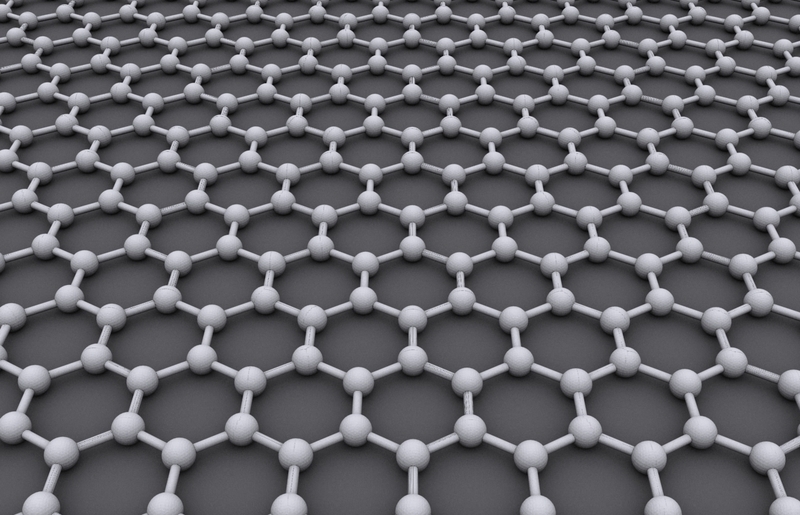 To build an all-graphene IC (pictured here), the researchers propose using one of graphene’s interesting qualities, that depending on its thickness it behaves in different ways. Narrow ribbons of graphene are semiconducting, ideal for making transistors while wider ribbons are metallic, ideal for gates and interconnects. For now, the UCSB team’s design is simply a computer model that should technically work, but which hasn’t been built yet. 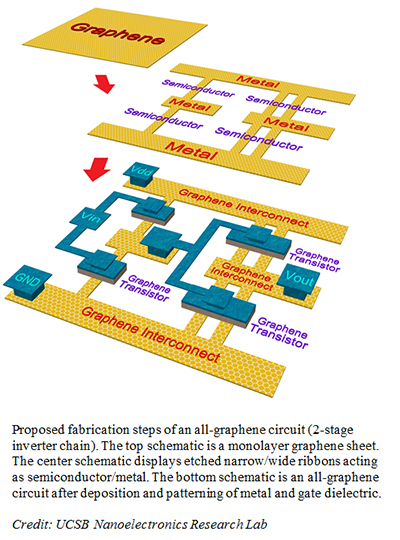 In theory, though, with the worldwide efforts to improve high-quality graphene production and patterning, it should only be a few years before an all-graphene integrated circuit is built. As for full-scale commercial production, that is likely to take a decade or so. When that happens though, another explosive period of growth in computing speed, coupled with lower power consumption is to be expected. From there, subsequent leaps are likely to involve carbon nanotubes components, true quantum computing, and perhaps even biotechnological circuits. Oh the places it will all go!